Almost a decade ago, Torque Logistics was put in charge of transporting specialty mining machinery built by US manufacturing business, Joy Global. Reflecting the company’s reputation for providing high-productivity equipment with a strong focus on safety, Torque called upon Freighter to supply the appropriate solution. Freighter supplied Torque Logistics with two drop deck T-Liners, both equipped with removable mezzanine decks. Representing one of the largest mining machinery producers in the world in Australia, Joy Global Australia does not settle with subprime material when it comes to delivering the valuable product to a client. 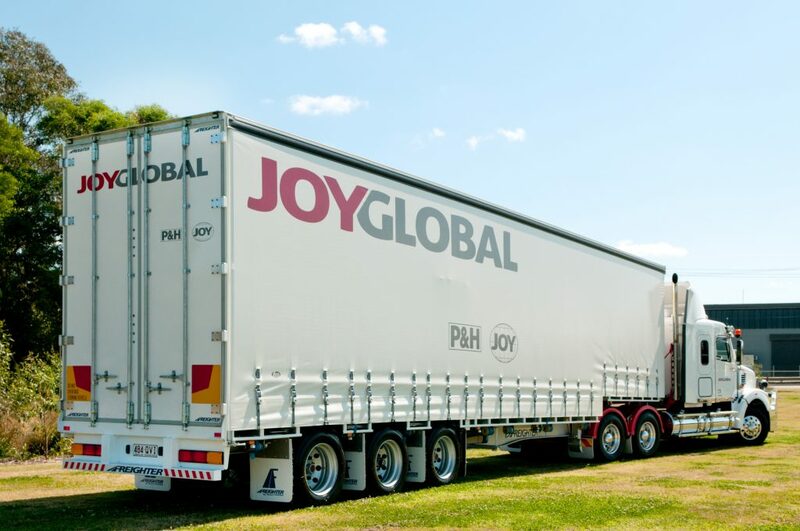 As a global corporation, Joy Global prides itself on offering a value-added service and is committed to assisting its clientele perform at the lowest possible cost while ensuring all 1,400 staff in Australia return home without injury or incident. 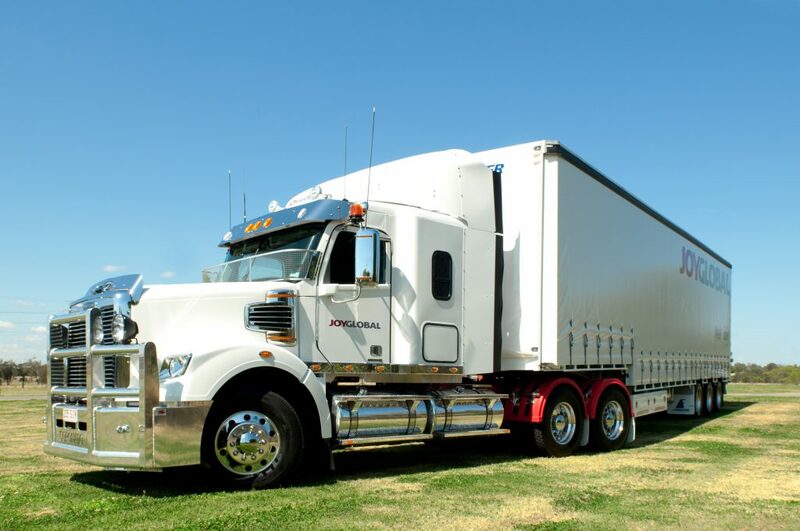 To achieve these objectives on the transport side as well, the company has chosen to work closely with local expert, Torque Logistics, a small family-owned company operating out of Brisbane. “We have a strategic, long term partnership that continues to develop. Torque’s fleet allows us to really establish a strong foothold in the local mining sector,” says Daryl Morrison, Warehouse Distribution Manager at Joy Global. To always have the right equipment on hand, Torque has built up a small, but versatile fleet of five trailers ready to deploy at a moment’s notice. It consists of two flat tops, one curtain-sider, and two drop deck curtain-siders that were recently added to the mix, both designed by leading trailer brand, Freighter, and built in the brand’s Ballarat factory. Trailer Sales’ Area Sales Manager, Richard Jenson (right), congratulates Torque Logistics Warehouse and Distribution Manager, Daryl Morrison, on the company’s new Freighters. 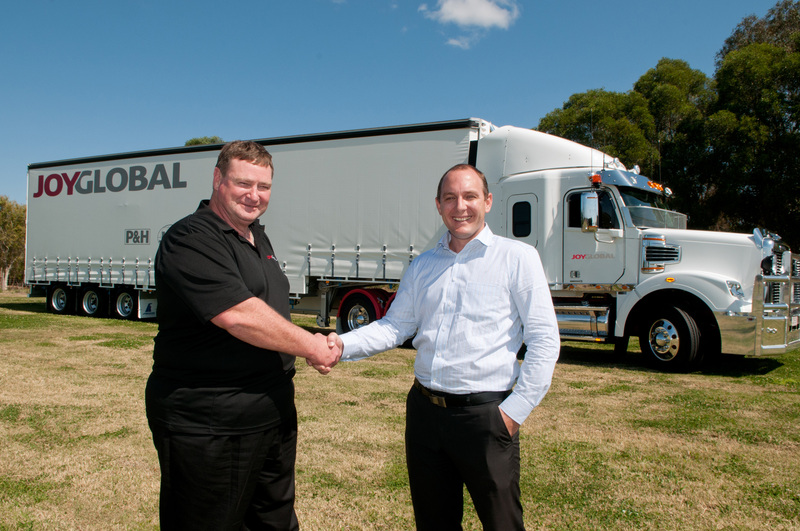 Mal purchased the trailers through Richard Jenson at Freighter’s Queensland distributor, Trailer Sales. “In terms of the presentation, Joy’s design team handled the colour scheme and logos on the curtains,” says Richard, having seen first hand that representing the client on the road in the best possible way is high on Torque’s agenda. But there is more to the two new curtain-siders than just the drop deck layout and a neat design – they can also boast mezzanine decks to maximise storage space – an option Mal says Freighter was more than willing to accommodate. Equally important to the interior design of the new drop deck model was the installation of reinforced tie down points on the floor. Mal says each tie down point had to be engineer-rated to hold the weight of the equipment in place. “Most of the equipment we need to chain down, in particular those huge 10-tonne gear boxes for mining machinery. The tie down points not only securely fasten the loads, but prevent the chains from rubbing up against the curtains as well, avoiding any long term damage,” he says, revealing that Joy and Torque share the same attitude in regard to OH&S. “Our highest priority is on safety, because we know it is directly correlated with higher levels of quality, efficiency and productivity — and therefore enhances overall performance for all of us,” he adds. The drop deck configuration of the trailers allows Torque Logistics to carry up to 34 pallets, as opposed to 24 on a standard flat deck design. As a result, Mal says the purchase of the two drop decks has brought “immense value” to the Torque operation. “The commercial transport industry is all about finding the right solution for each individual client. We are Joy’s first choice in terms of transport services, and Freighter is our choice for sourcing sturdy, versatile transport equipment that enables us to maximise our payload without having to resort to a B-double configuration. In effect this is not only a cost saving measure, but also saves time considering we don’t need to worry about unhooking and hooking trailers,” Mal adds.